I have great friends who share their great recipes with me-this is definitely one of them! While I have had this dish several times, this was my first time making it myself, and I was quite impressed with how quickly it all came together. WIN! Trim broccoli and wash. Cook fresh broccoli in water in a large skillet about 5 minutes until crispy tender; drain well (set aside). HINT: cut broccoli into bite-sized pieces. Heat olive oil in same skillet with garlic pieces for 5 minutes, but do not allow the garlic to brown. (This is what gives garlic a bitter taste.) Remove garlic pieces; add diced pepperoni and cook about 5 minutes. Add broccoli and brown lightly. Cook pasta, following label directions; drain and return to kettle. 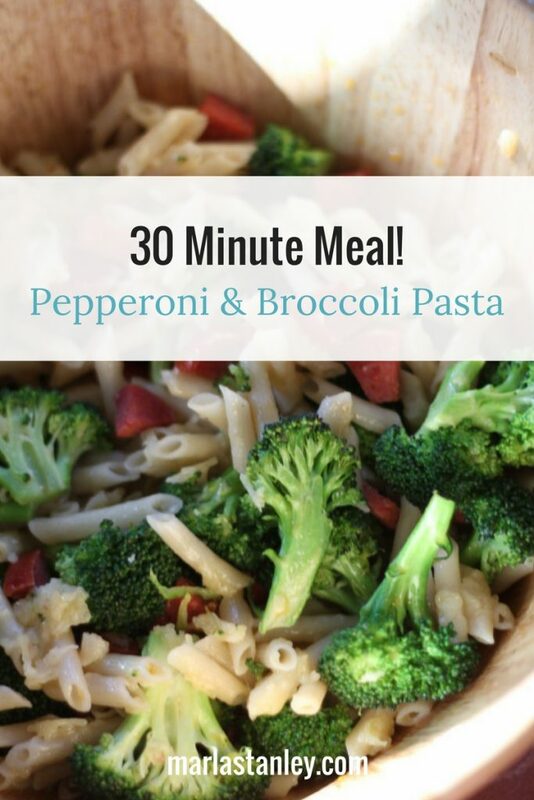 HINT: start water for pasta when you are working on the broccoli, that way you can put pasta in to cook about the time you are cooking the pepperoni. Add butter to pasta and toss to coat evenly. Add Parmesan cheese and toss well; then add broccoli-pepperoni mixture and toss them all gently to distribute evenly in pasta. Turn out onto heated serving platter and serve with additional Parmesan cheese, if you wish.